New instances are constantly being spun up in Microsoft Azure, others are being closed down, keeping track of it all can easily become a full time job! Go to 'All services' and select 'App registrations' from the 'Identity' section (or use the search). Click on the 'New application registration' button. In the menu on the right of the screen, enter a name (we recommend 'Intruder' or something similar), select type 'Web app / API' and enter 'https://portal.intruder.io' as the 'Sign-on URL' - then click 'Create'. 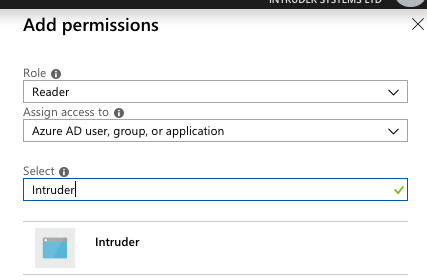 Click on the 'Intruder' application that we just created and take a note of the 'Application ID' (or copy it into the text document!). Create a key by entering a description (e.g. 'Intruder') and setting a duration (i.e. when you want the key to expire). Please note that Intruder will no longer be able to access your Azure account when the key expires. Now go back to the 'All services' menu and select 'Azure Active Directory' from the 'Identity' section. Click on 'Properties' in the left menu of the Active Directory screen. Note (copy and paste into text doc!) the 'Directory ID'. Go back to the 'All services' menu and select 'Subscriptions' from the 'General' section. Click on your subscription and note (copy and paste into text doc) the 'Subscription ID' of your subscription. Then select 'Access control (IAM)' from the left menu and click 'Add'. From the first dropdown, select the 'Reader' role (we require read-only access in order to fetch your public IP addresses). In the 'Select' text box search for the application we created earlier (e.g. 'Intruder' or whatever you chose to name it). Select that application, and click 'Save'. 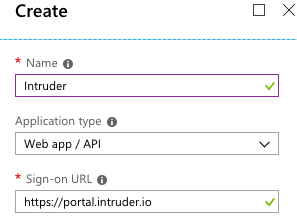 Log into the Intruder portal, head to the cloud settings page and click on the Azure logo. Enter the Application ID, Application secret key, Directory ID and Subscription ID and click the button to add your Azure account. Once you've clicked to add your Azure account, you'll see a popup asking whether to activate CloudBot. CloudBot keeps a constant watch on your Azure account and will automatically add any new external IP addresses or hostnames as Intruder targets. For more information see the CloudBot help page. 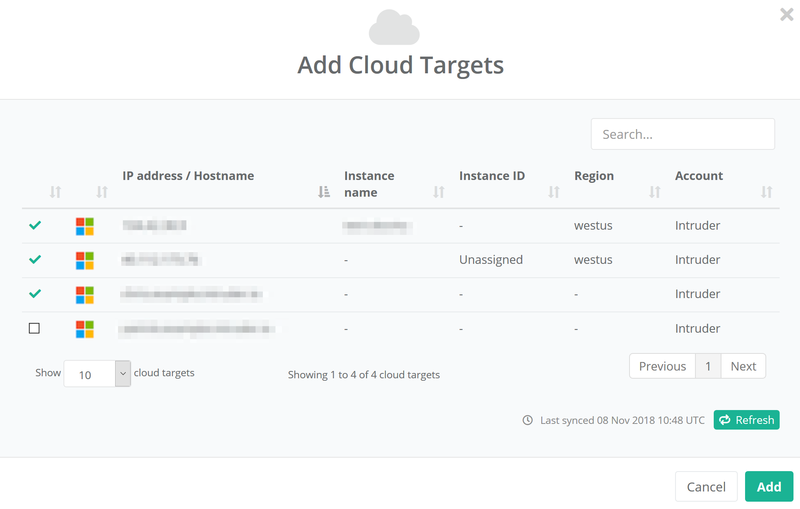 Once you've added an Azure account, you'll be able to see the public IP addresses and hostnames from DNS zones in the Add Cloud Targets popup on our targets page. To add them for continuous monitoring, simply select the IP addresses and hostnames you want as targets and click add. Note: Azure integration is only available for customers on our Pro and Verified plans.